In 2011, the rock world lost an incredibly gifted singer and songwriter, a man whose voice reverberated around the world on such blockbuster hits as “Cherry Pie”, “Down Boys”, “Sometimes She Cries”, “Uncle Tom’s Cabin” and the unforgettable ballad “Heaven”. Jani Lane joined WARRANT in 1985, and together the band lit up the L.A. club circuit, becoming an international sensation with multi-platinum albums and an adoring fanbase. Always a music lover at heart, after Lane left WARRANT in 2004, he continued to write and record, often paying homage to some of his musical heroes by participating in tribute projects to CHEAP TRICK, JUDAS PRIEST and others. Now a new CD compilation collects some of these superb solo performances in one convenient package and for the first time ever on vinyl! 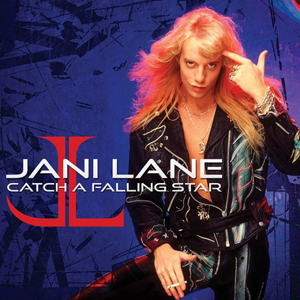 Catch A Falling Star, which includes Lane’s takes on UFO’s “Doctor, Doctor”, DEF LEPPARD’s “Photograph” and BON JOVI’s epic “Lay Your Hands On Me", was released February 26 on Deadline Music.